SEC range is suitable for all categories of industry. Recently innovated range marks wealthy design backlog of all key components. We took care of the vibrations. SEC range is built on a robust independent base frame platform with vibration absorbers. Our conception leads to long term stability and reliability of the whole machine. Our range belongs to high quality products because of its low noise level due to specially designed inlet and outlet of cooling air. The air end and electric motor is standard coupled with Poly V-belt, which is a proven solution, especially used in automotive industry. The air delivery is controlled by a single stage control unit, which controles the air intake valve. If the air consumption is to low, the machine automatically stops after the idling time and later on starts up again. The air intake valve open/close works based on signals from a pressure sensor. The compressors are protected against non standard conditions by an automatic shut down system, if the maximum oil temperature is reached, exceeded or reaches too low minimal pressure. The electronic system allows working time programming based on air consumption. Our compressors are possible to operate under the advanced control systems like ATMOCON, ENERCON, METACENTRE or CAM. The Airmaster S1 control unit is standard equipment in our SEC range, VARIO models with AIRCON L1 on request. 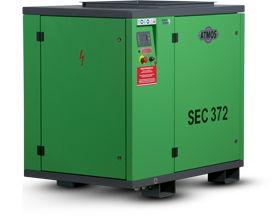 Our variable speed drive machines VARIO are available in each category from 22 up to 250kW.